It's almost ten years since 'Jonathan Creek' ceased as a regular British telly staple but the sleuth's subsequent returns have always felt welcome, albeit perhaps a tad forgettable. 'The Clue Of The Savant's Thumb' is another welcome addition to the canon, and likely to be a more memorable one at that. Arguably not for the best of reasons. Spoiler-free review below. 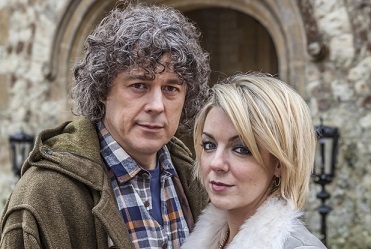 The "impossible" disappearance of a dead body from a locked room attracts the interest of unconventional investigator Joey Ross (Sheridan Smith) who tracks down old partner Jonathan Creek (Alan Davies), now a businessman and married to Polly (Sarah Alexander). Creek soon reverts to type and joins the investigation led by DI Gideon Pryke (Rik Mayall), taking in a seemingly sinister secret society and the deadly history of a Catholic school. Joanna Lumley makes a relatively rare dramatic appearance as the wife of the deceased, while Mayall returns to 'Jonathan Creek' in a glorious fashion - maybe even outshining Jonathan Creek himself. But then, Creek has always been the understated one, satisfied with his quietly brilliant manner of solving mysteries. His relationship with Smith's Joey doesn't feel quite as natural as with previous partners, Caroline Quentin and Julia Sawalha, but is sufficiently charming nonetheless. The mystery itself turns out to be quite ridiculous but it is the extremely questionable transgender joke toward the beginning of 'The Clue Of The Savant's Thumb' that most deserves criticism. Disappointing work from series creator David Renwick, writer and director of this episode, who also overly relies on clichéd horror tropes - ominous music, characters wandering off on their own, and so on - to drive his plot. Overall though, 'The Clue Of The Savant's Thumb' is a reasonable 'Jonathan Creek' offering, with a smattering of accomplished dry wit and investigative work, alongside a fairly interesting meditation on faith and reason. Creek himself is the saviour, with Alan Davies settling back into his likeable role with ease. The Easter weekend has indeed been an appropriate time for the return of JC. Watch 'The Clue Of The Savant's Thumb' at BBC iPlayer for a limited time.